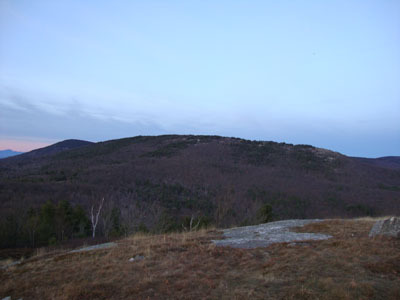 Part of the Belknap Mountains, Piper Mountain is located south of the present day Gunstock ski area. Presently, multiple hiking trails ascend the long, ledgy summit area. The Piper Mountain Trail may or may not have been improved for alpine skiing by the CCC during the 1930s. This trail may be the present Piper-Whiteface Link hiking trail, but is not the present day Piper Mountain Trail (opened in the 1960s). It is likely that the ski trail lost popularity with the start of chairlift served skiing at nearby Mt. Rowe and Gunstock Mountain.
" Piper Mountain Ski Trail. This trail starts at a gateway on the L. of the road skirting the W. base of the range, about 4 m. S of Gilford and about 400 ft. S of A. W. Clark's farm. The route leads uphill through an open pasture for 1/4 m. and then enters the woods as a trail 40 ft. wide. At the summit ledges it joins the Ridge Trail. This trail, dropping 1,000 ft. in 1 1/4 m., is with 12 to 15 inches of snow, suitable for intermediate and expert skiers. The open slopes at the foot are suitable for novices. The road to the foot of the trail may or may not be plowed and cars will have to be parked wherever possible, off the road. " 1. Location - Piper Mt. starting from A. W. Clark farm. 2. Length - 1.5 mi. 4. Max. Grade - 11º-15º. 5. Vertical Drop - 1000'. 6. Exposure - S. 12" snow.
" Piper Trail. 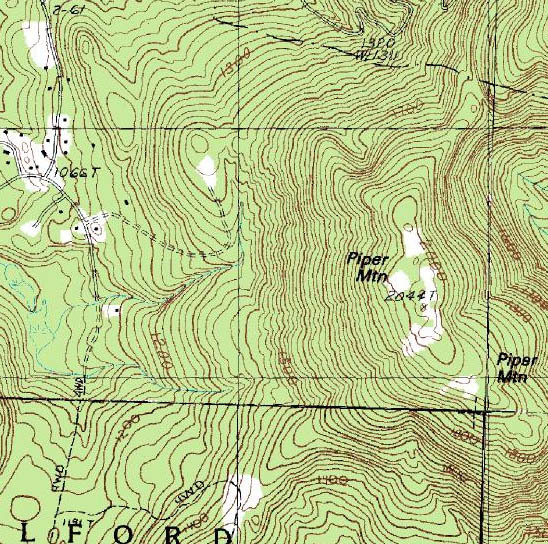 Piper Mt., starting from A. W. Clark's farm. Length 1.5 m. Max grade 11º-15º. " " Piper Mountain Trail. This trail starts at a gateway on the L of the road skirting the W base of the range, about 4 m. S of Gilford and about 400 ft. S of Robert Brayman farm. The route leads uphill through an open pasture for 1/4 m. then enters the woods with a 40 ft. width. At the summit ledges it joins the Ridge Trail. This trail provides good skiing. The road to the foot of the trail may not be plowed and cars will have to be parked wherever possible, off the road. 1 hr. (on foot). "